This simple salad, fortified with nutrient-rich seeds, is finished off with a thick, luscious dressing, infused with fresh ginger, garlic and lemon. 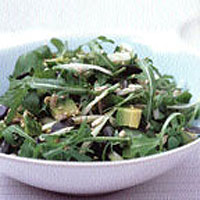 Toss all the ingredients for the green salad in a large bowl. Put all the dressing ingredients in a blender, blend to a purée, then transfer to a jug. Dish the salad out onto plates then your guests can dress their own salad. You can make the dressing in advance but, if chilled for more than an hour, it will become very thick.